One of the most well-known multinational companies in the world is Apple Inc. It is a corporation that designs and manufactures consumer electronics, computer software, and commercial servers. Among its best-known hardware products are the Macintosh computer, iPod, iPhone, and iPad. Because of its technologically advanced products and high-quality software, Apple has undeniably left a good mark on many consumers. In 2013, Apple passed Coca Cola as the most valuable brand in the world. The Apple logo is derived from the story of Adam and Eve in the Bible. The bitten apple represents the fruit from the “Tree of Knowledge”. It’s oftentimes traced back to Newton’s apple which isn’t completely true, and Apple logo designer Rob Janoff claims that the bite was only placed so it won’t look like a cherry. Clever thinking! These 45 Free High-Quality Apple Wallpapers make up a showcase of astounding Apple-themed wallpapers that you can use to add personality and class to your desktop. The collection is composed of unique apple wallpapers that you won’t want to miss. 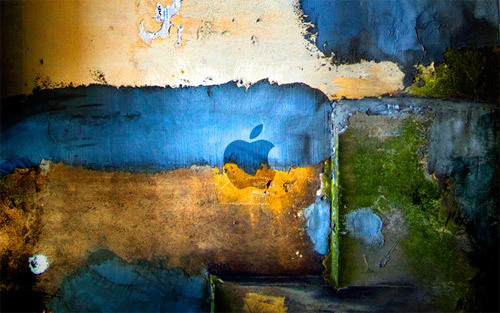 Whether you’re using a Mac or a PC, an iOs or an Android, we see no reason why you shouldn’t have these creative takes on the Apple logo as your wallpaper. UPDATE: This post was originally published on March 11, 2010. Ten 404 items were removed. Enjoy, Creatives!